Originally posted December 2nd. 2012. In the last several weeks (Oct/Nov 2012), we noticed that the signatures set to be auctioned off by Juliens, called “The Collection of Tompkins & Bush: Michael Jackson” did not look like Michael’s known authentic signatures. We took the info to some authenticators to see what their opinions were. They had the same opinion as we had. Not likely authentic. The authenticators contact Juliens. Juliens replied that they had full confidence the signatures were real and they were going forward with the auction. AND THAT THEY HAD A VIDEO OF MJ SIGNING THE ITEMS BEING OFFERED FOR SALE! 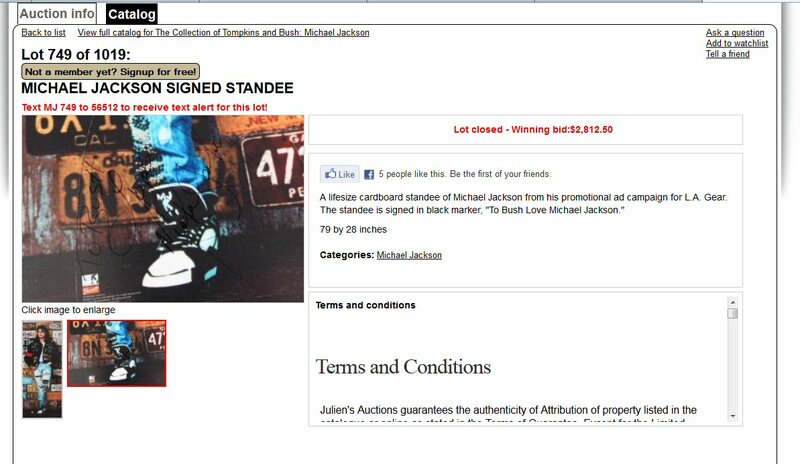 We were then notified by Justin one of the items bid on and won (a Michael Jackson LA Gear Standee), was “signed” To Bush Love Michael Jackson, but…… this wasn’t possible. Per Bravado the signed Standee was not manufactured until after Michael Jackson died. Bravado, confirms this via emails below. 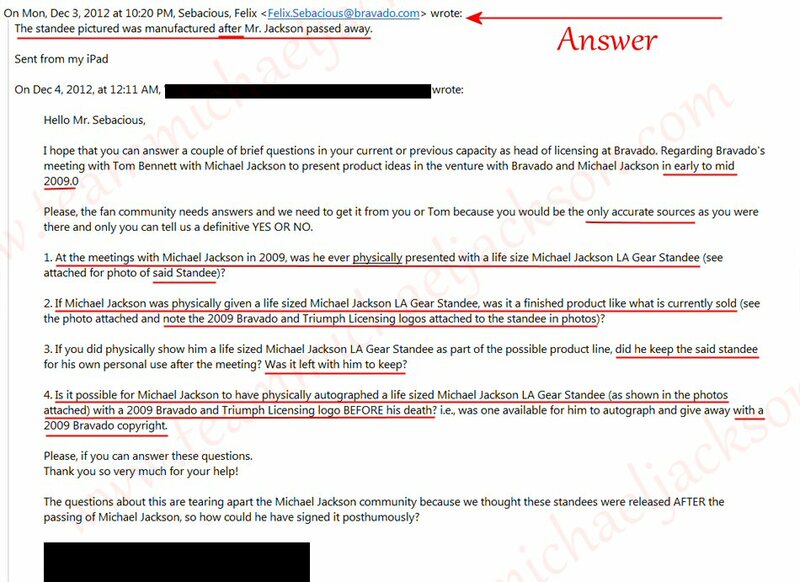 Also below is court documentation stating when the Estate began having merchandise talks with Bravado (after Michael died), and the date Triumph was re-licensed under the Estate. They had been defunct since 2003. 2 EMAILS from Bravado, the 2nd one is complete with questions the fan base had asked. 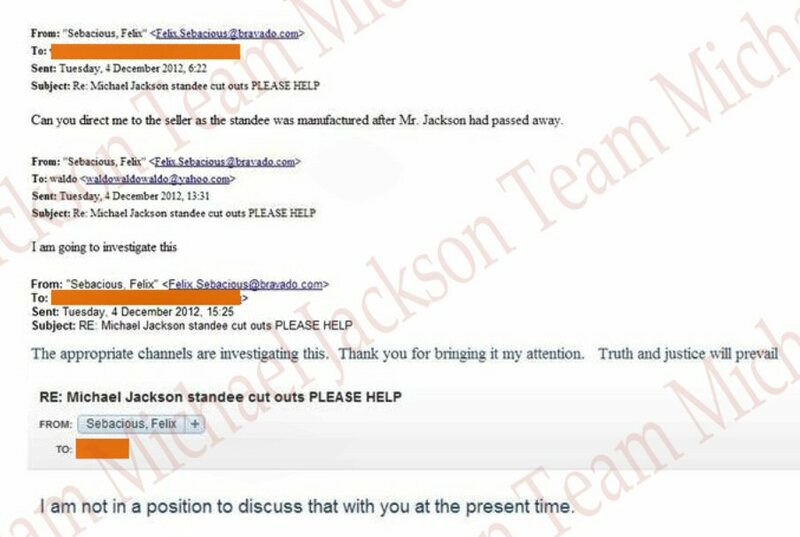 **UPDATE: It has come to our attention that some MJ fans were wondering if there was another reply to the questions. The answer received after asking the questions is at the top. Felix and the writing fan are on different time zones. She is several hours behind him. Also note when you receive an email reply from someone, their reply is at the top, their reply also does not indent as far in as the original email which has the questions. This can be seen her in email below. CLICK PHOTO TO ENLARGE FOR DETAIL! Another interesting thing we’ve learned since investigating this, is the MJ dancing feet logo never had the words TRIUMPH INTERNATIONAL, INC. under it until after Michael died. This is the logo, it can be seen above in the standee’s image. Below is Felix Sebacious sworn Statement. Michael met with Bravado in early June 2009 to approve merchandise designs created by Bravado in connection with the “This Is It” tour. If you note the word “created”… to create by definition, means to “make into existence, something new”. Since the “LA Gear Campaign” was created years ago, it didn’t need to be recreated for approval again. Also note, “After Mr. Jackson’s untimely death….” Bravado now enters into agreement with the Estate AND Triumph, not mentioned earlier. “Triumph International, Inc” licensing was suspended from 2007 through 8/14/2009 (see State licensing info below). It was revived by the Estate 8/14/2009. 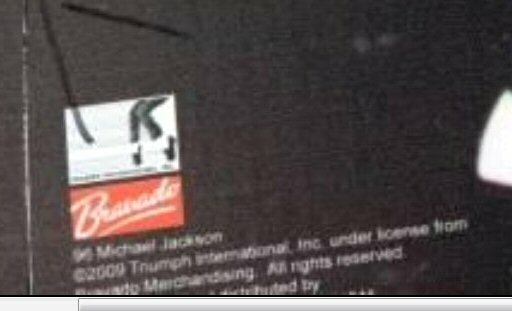 The print: 2009 Triumph International Inc. under license from Bravado Merchandising was have been printed AFTER Michael died. This additional information should be final for anyone who had any doubts remaining. We are also carefully inspecting the rest of the items as we are sure there will be more blips that hit our radar. Darren Julien was contacted by a Professionals in authenticating signatures. He refused to listen to reason. In our opinion, the popularity his business received from the sales of these Michael Jackson lots, not to mention the hefty 35% commission was far more important. We here at TeamMichaelJackson hold Darren Julien just as responsible as Michael Lee Bush. It was Darren Juliens duty as the consignee of this auction to have professionals authenticate the lots that he was offering to unsuspecting bidders. It was his responsibility to protect the bidders/buyers. Juliens Auctions took to banning fans from their facebook page if questions were asked in regards to the signatures. Juliens chose to brush this mass production of forgeries under the carpet. It is a disgrace how a reputable auction house treated customers that trusted them!! I would like to add that today, members of TeamMichaelJackson was outside Juliens auctions, since they blocked us on facebook. We were there to inform them that they should shut this auction down, they responded by saying “Officers are on the way”. We stood outside with a boards to inform the general public. A friend of Darren Julien’s came outside yelling and harassing our members, and called 911 with false allegations of physical harm, nothing came of the false allegations! Police informed the abuser/friend not to harass our members again, but it continued throughout the day, our members was there from 8:30 am to 5 pm. Darren Julien is now threatening to sue two professional authenticators. http://web.archive.org/web/20091007231007/http://thisisit.shop.bravadousa.com/Default.aspx there is no LA gear Standee’s noted even at this time. Only merchandise in connection with “This Is It”.